Valletta itself is an architectural masterpiece. Surrounded by the towering and majestic fortifications built by the Order of the Knights of Saint John, it is a treasure trove of architectural beauty containing beautiful baroque buildings, spectacular palaces, impressive churches, stunning theatres and picturesque gardens. The Knights, well-known for their devotion to the Catholic faith and their love of palaces, made sure to include much of each in the city they built. In fact, one of the first buildings erected in Valletta was the Our Lady of Victories church, a testament of their faith and victory over the Turks in the Great Siege. 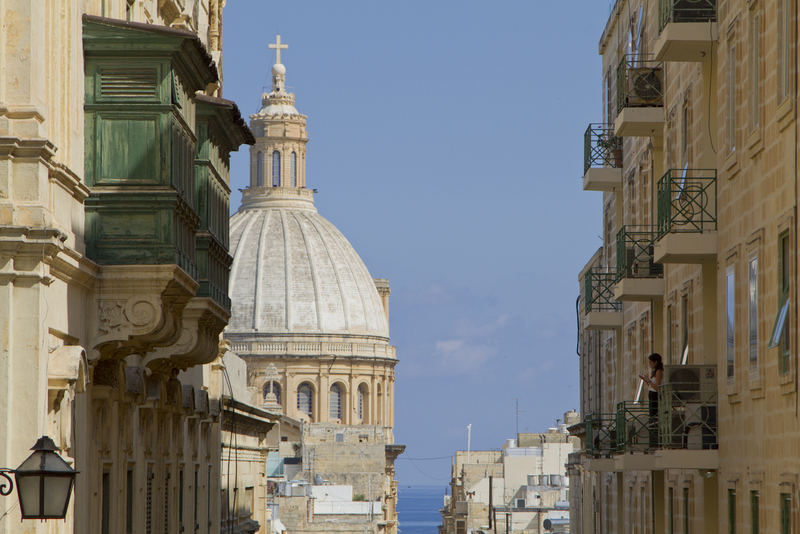 At present, over 25 churches can be found in Valletta. Perhaps one of the Knights’ most impressive creations to date is St John’s Co-Cathedral, a majestic Baroque cathedral which is home to a great deal of artefacts donated by the Knights. The Knights also constructed a number of palaces located around Valletta which they called auberges and which they dedicated to the different langues of their Order. One of the most breathtaking structures built is the Grandmaster’s Palace, an architectural gem located in the centre of Valletta. Originally the Auberge d’Italie, and designed by Glormu Cassar, it houses splendid works of art such as tapestries and frescoes, as well as a magnificent Armoury. Within its walls, one can also sit down and relax at the gardens which provide bird’s-eye-views of the Valletta’s ports and the surrounding areas. From Hastings gardens, on the western side of the Sciberras peninsula, one can admire the Marsamxett harbour and the spectacular structures which line the water’s edge. On the western side, one can see the beautiful fortifications of the three cities of the Cottonera area, as well as the Grand Harbour. Valletta is currently undergoing a revival process in which old areas that were previously left to rot are having some life injected back into them. Strait Street is the paragon of this rejuvenation process which is currently happening in Valletta. Left abandoned up until recently, it has become one of the busiest Valletta streets at night with its bars, restaurants and wine bars. The old abattoir is also getting a face lift and is planned to become a centre of creativity and art. However, Valletta has also evolved with the times and now also boasts modern architecture such as the new Barrakka lift, which also has a contemporary, experimental style, as well as the new Parliament building, designed by Paris-based architect Renzo Piano. Piano has also worked on the old Royal Opera House, which was devastated by a bomb in World War II, by merging the theatre’s surviving original structure with his modern vision. Valletta has not shied away from embracing change. It retains its historical heritage while also moving forward becoming a hybrid containing buildings both old and new. Valletta, or Il-Belt, as it is more commonly known as by the locals, is the capital city of Malta. Named after Jean Parisot de La Valette, a Grandmaster of the Knights of the Order of Saint John who commissioned its construction right after the victory of the Great Siege of 1565. The city was designed by Italian architect Francesco Laparelli who was an assistant of the great Michelangelo. Laparelli, who died before the city’s completion, was succeeded by his assistant Glormu Cassar, a Maltese architect. Valletta has seen its fair share of revolts and still stands proudly to this very day, welcoming all those who wish to explore it. The dream child of the Grandmasters of the Order of the Knight’s of St John, this city’s majesty is bewitching and will surely captivate the hearts of all those who enter through its gates.